Learn tips and tricks for how to paint laminate furniture with this step-by-step video tutorial. Learn how to paint laminate the right way – and no more chipping paint! For the last 4 years, I’ve been painting a lot of furniture! Some of the the furniture I’ve been painting is laminate furniture, which can be a little scary. 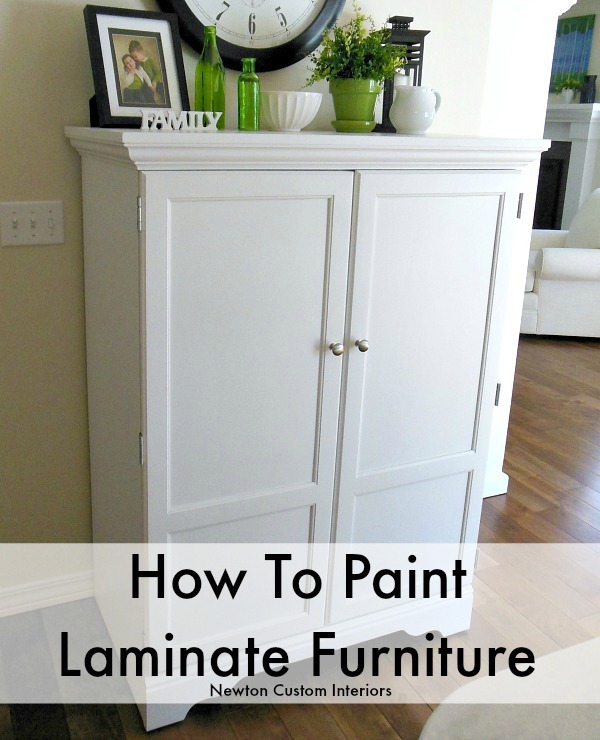 Along the way, I’ve figured out a few tips and tricks for how to paint laminate furniture, and that’s what I’m going to share with you today. 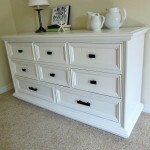 If you’d like to learn how to paint furniture that is not laminated, check out my popular How To Paint Furniture post! One of the pieces that I’ve painted is our microwave cabinet. The doors and the top are real wood, but the sides and insides are all laminate. 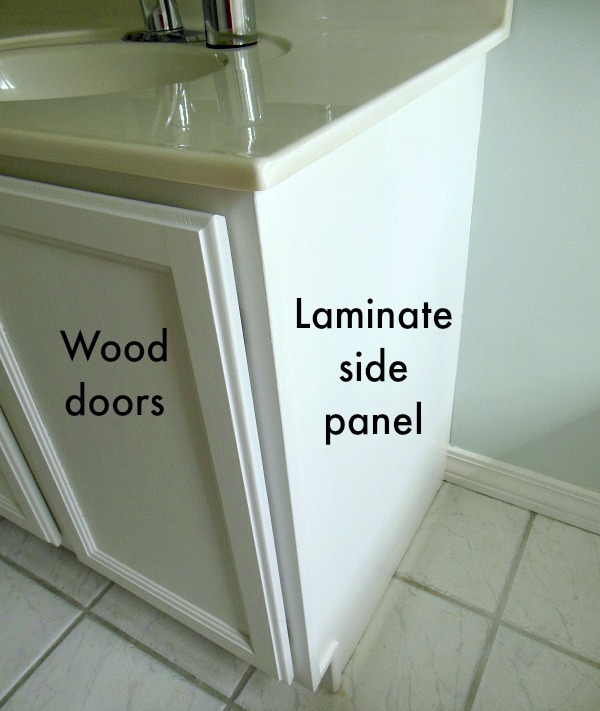 Also, the sides of our bathroom cabinets are laminate. 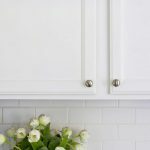 You can learn how I painted our cabinets here. So, why is laminate so tricky to paint? Laminate is a picture of wood that is glued to particle board or MDF. It’s non-porous and shiny, so paint won’t adhere to it very easily. The tricky part is sanding the laminate enough for the paint to stick, but not sanding it so much that you sand the picture of wood off! If the laminate isn’t prepped and painted properly, the paint will bubble up or chip off very easily. TSP Substitute – This is a liquid form of TSP (trisodium phosphate) which is a heavy duty cleaner and de-greaser. 100 Grit Sanding Block – (not pictured) Used to sand the laminate. Tack Cloth – (not pictured) Used to clean the dust from sanding the laminate. Wooster paintbrush – I LOVE this paintbrush! The soft rubber handle makes it comfortable to use for hours. Whizz microfiber roller and handle– This roller is fabulous! The smooth finish it gives is almost as good as the finish you get from spray painting. My one tip for using it would be to slightly dampen the roller with water right before you start to paint with it. Pittsburgh Paint’s Breakthrough paint – if you use this paint, you won’t need to use an oil-based primer for your first coat. Clean the laminate with TSP Substitute. 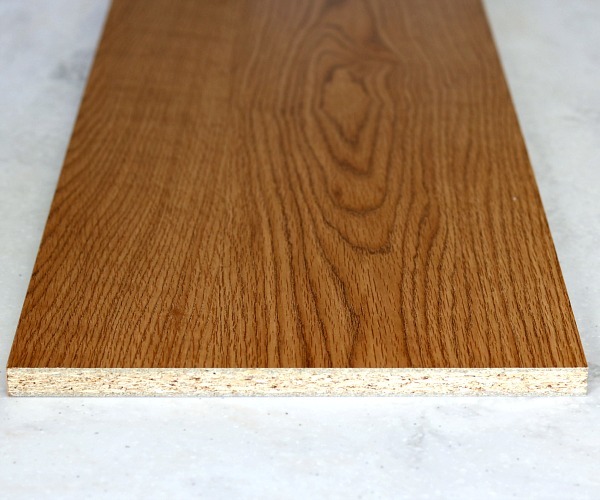 Sand the laminate with 100 grit sanding block – being careful not to sand through the laminate. Wipe laminate clean with tack cloth. 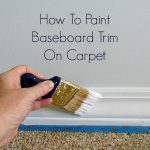 Paint the laminate using the Wooster brush or the Whizz roller and the Breakthrough paint. Apply 3 coats, allowing the paint to dry a couple of hours between coats. No need to sand between coats of paint. If you use another brand of paint, I recommend that you use an oil-base primer as your first coat. If you enjoyed this How To Paint Laminate Furniture tutorial, be sure to check our How To Paint Furniture page for more painting tutorials! Thank you for the great tips! My husband and I discovered TSP about a year ago for our paint projects and love it. It makes such a difference in making the paint adhere and be smooth. I hope that you have a wonderful day!!! Thanks Shannon! Yes, TSP is a great product! Especially the TSP Substitute, which is easier to use. Thanks so much for this Jann! I am about to paint a partial laminate dresser. these tips were fantastic. Thanks Heather! Good luck with your project! I recently re-did my kitchen cabinets… many, many kitchen cabinets. The doors were wood but all the boxes were laminate. I used a similar process to yours EXCEPT since I did a white wash finish instead of a solid paint finish which only complicated the problem with the laminate, particularly on the ends. Because I needed the faux wood-grain to remain, I sanded extremely lightly just to get a little tooth. I followed with a clear acrylic polyurethane which allowed me to then use the poly white wash. Everything matches wonderfully. Jan, I’m glad your project went well! so do you need too apply a topcoat of poly (i dont know how too spell it off the top of my head lol) to seal it and make sure it doesnt chip off? will it be shiny like before? or just look like paint? Crystal, you can apply a couple of coats of poly if you would like to protect the piece. The surface will look like your paint. The paint type will determine how much shine you will end up with. I used a paint with a satin finish. I also use Wooster brushes and I love them. These are great tips for painting laminate properly. Thanks Lisa! I have small hands, so this Wooster brush is perfect for me. Very comfortable to paint with all day! Thank you so much for the great info! I have projects I can now work on as I had no idea how to paint laminate! Also, would this technique work on laminate covered tile board? Thanks Lori! I have never tried to paint laminate covered tile board, so I don’t know if this technique would work for it. do you know of any program where you can upload a pic of your project and apply colors on screen so that you can see colors before you paint them? Paula, I just saw one on the Pittsburgh Paints site when I went to research the Breakthrough paint that Jan mentioned. Paula, that turned out lovely. Thanks for all of the great info! Jann, I’ve used TSP before, but never prior to a paint project! I will definitely give it a try the next time I need to paint laminate or other surface. Thanks for the great tips. Lynn, be sure that you’re using the TSP Liquid Substitute, not the regular TSP that is a powder. The regular TSP is very hard to rinse thoroughly, so it can affect the finished laminate paint job. Ask me how I know! As I do a lot of painting furniture these tips were very handy thanks Jann. Thanks Catherine! I’m glad the tutorial was helpful! Hi, I’m new here. I just got a table from a flea market that has a laminate top. Question us can I use a chalk paint on it? Or. Should I do the same process, then do chalk paint? What if I wanted to use a gel stain on top? LInda, I’ve never used chalk paint, and so I don’t know how it will stick to the laminate. My only experience is using the process in this tutorial. What if you have a piece of furniture that is missing most of the laminate? I am trying to restore a dresser that has much of the particle board exposed. Carol, I’ve never tried to paint laminate that had some of the particle board exposed, so I can’t really give you any guidance for what to do in that situation. Thank you a thousandftimes! I have been wanting to paint a laminate chest of drawers but had no idea how to even begin. Your great tutural has been my answer. Again many, many thanks! Maggie, I’m so glad the tutorial was helpful! Good luck with your project. 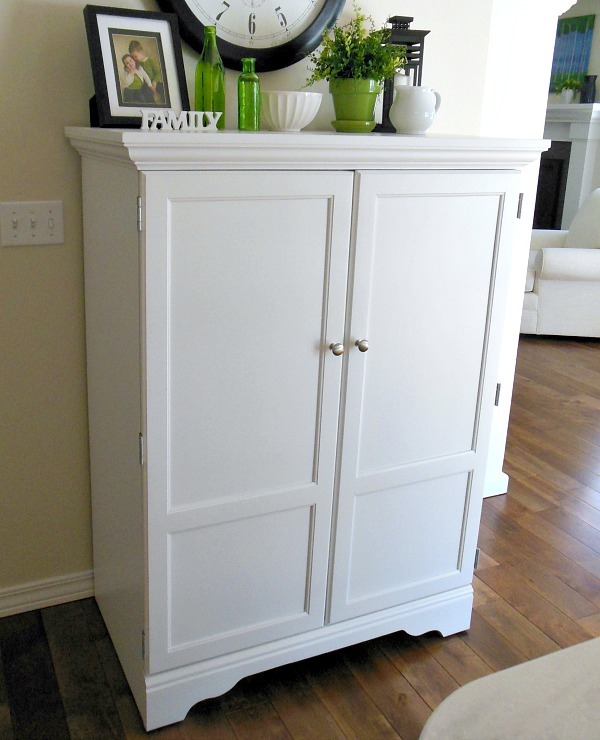 I am wanting to paint my wood grain laminate pantry white. How do you deal with the edges on the doors? I’m not sure what you mean. All of the laminated parts are painted the same. If that edge on the door is not laminated, then I don’t know what you can do. This tutorial is only for painting laminate. I have a little damage on my laminate door that I want to paint. It looks as if it was ripped off. What do you recommend? I don’t have any experience repairing laminate furniture before painting it. I would do a Google or Youtube search to see if you can find an answer. I’m hoping to use this technique for an office desk I inherited. I can’t seem to find Breakthrough paint in my area. I purchased the Kilz primer, but I’m wondering if you have any recommendations for the main paint color (brands, etc) — the desk will be white. Sorry, I don’t know of a comparable paint. I would call the local paint stores, not big box stores. I would be surprised if you don’t have a paint store that carries Pittsburgh Paints.